← Signs of Spring 1: Do You Remember the Color Green? I Googled “biodiversity” and got a list of 14,600,000 web sites (in 0.17 seconds!). These sites defined the term (“the variety of life in a habitat, ecosystem, or the world”) and gave many specific examples (the biodiversity of this exotic island or that sheltered natural area etc.). The list also contained many recent and a few not so recent news stories about biodiversity and species abundances. I also found, as I clicked through the pages and lists, a very neat set of quizzes that tested my knowledge of biodiversity. Like the Pittsburgh Eagle Cam I talked about last week, these quizzes are a great way to waste a great deal of time! There is, of course, a thin, wavering line between questions about biodiversity and questions about biological trivia, but all of the quizzes are great fun. I will add a few questions (taken mostly from the Biodiversity IQ Test from Foothill College in California) as we go along today (answers are at the end of the blog!) 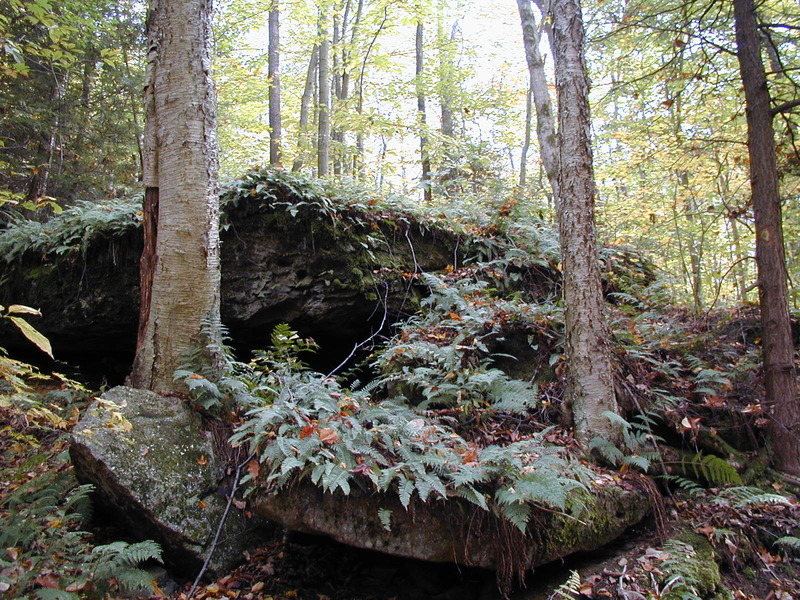 (photo above by D. Sillman: Rock Furnace Trail, Armstrong County, PA). 1. Which of the following actually exist? Urban ecosystems seem the antithesis of biodiversity, but an extensive study looking at the impact of urbanization on the diversity of plants and animals recently published in the Proceedings of the Royal Society B: Biological Sciences highlighted many important aspects of city ecosystems. One standard hypothesis attached to urban ecosystems concerns the overwhelming structural similarities of cities around the world. Since the physical habitats of these cities are so similar, the hypothesis states, they probably favor a limited set of species that are hardy and very generalized in their food and habitat preferences. Cities, according to this hypothesis, should all have very similar biotic communities. This idea, though, was not supported by this recently collected data. Looking at the plants and bird species of 110 cities around the world the study emphasized that each urban area retained a unique set of endemic (“native”) plant and bird species. These species combined with a number of shared, “urban-tolerant” species generated unique biodiversity profiles for each urban area. Cities, of course, had fewer plant and animal species than surrounding “natural” areas, but cities were shown to support nearly 20% of the world’s bird species and 5% of the world’s plant species. Urban areas were far from the “biological deserts” that they have often been hypothesized to be. 2. What is the most serious threat to biodiversity? 3. If you decided to throw a party to celebrate the diversity of life on earth and wanted to send an invitation to each known species on Earth, how many invitations would you need? 4. If you wanted to throw that same party for ALL of the species on Earth (both described and not yet described) how many invitations would you need to send? I am, as usual, looking out the window over my writing desk. The scene outside is dominated by sunshine and brown leaves covering brown grass. It is edged by twenty-foot tall arbor vitae, fifty foot tall spruces, a long stand of crabapple trees, two American chestnut trees, and several tall, thin, scarlet and white oak pole trees. Each year, I have added (but mostly abetted by just not removing naturally planted seedlings) new trees into this mix. I have mostly through inaction helped this yard’s vegetative and structural biodiversity and now have great numbers of cardinals, song sparrows, titmice and chickadees, blue jays and woodpeckers (I saw the pileated woodpecker pass through this morning!). Adding a food source, adding a year-round water source gets species to start lining up looking for a spot to nest or den up. One of the lessons learned from the Urban Ecosystem study and from our Harrison Hills Park collections and my observations on my back yard is that a habitat that is left alone and allowed to repair itself will in a short period of time be occupied by an increasingly diverse community of plants and animals. 5. If we gave a prize for “the strongest creature for its size”, which of the following would win? 6. Which of the following environments on our planet are too harsh to support life? a. Boiling sulfur springs, where temperatures are commonly 212 degrees Fahrenheit. b. Deep-sea hydrothermal vents called “smokers” where the temperature can reach 662 degrees Fahrenheit. So, this has been a bit of a ramble. With the unfolding spring we will see more and more species around us. But what is the purpose, what is the “use” of biodiversity? There are many answers to that question. Diverse ecosystems tolerate disturbance and stress better than simple ecosystems. An ecosystem with a rich biodiversity will house the vital pollinating species that we need not only for our wildflowers but also for our food crops. A diverse ecosystem will recycle nutrients, generate oxygen, absorb carbon dioxide, and clean up our water and air. A diverse ecosystem is full of species that have unique genes and proteins that may be the tools for our ultimate survival on this rapidly changing planet. Most of all, though, a diverse ecosystem fills us with joy and awe and connects us to the continuity of life and living on Earth. 2. What’s the most serious threat to biodiversity? All over the world habitats are being turned into agricultural land, harvested for wood and fuel, and destroyed or changed to build roads, schools, malls and other human developments. Because the human population is growing so quickly and consuming so many natural resources, habitat loss is occurring at a rapid pace. 3. If you decided to throw a party to celebrate the diversity of life on earth and wanted to send an invitation to each species, how many invitations would you need? 4. And for ALL the species? Some scientists have estimated that as many as 100 million species may actually exist, but this 8.7 million figure was recently published in the New York Times (actually it was 8.7 million +/- 1.3 million). 5. If we gave a prize for “the strongest creature for its size,” which of the following would win? An ant can carry a load up to 50 times its body weight. Amazingly, life has been discovered in all of these harsh environments. Newly identified microorganisms called “extremeophiles” thrive in unimaginable conditions, like boiling sulfur springs and polar ice fields.